Universal low-pressure trigger flash,and S1,S2 wireless trigger flash. Canon Rebel T5i T4i T3i T3 T2i T1i SL1, EOS 700D 650D 600D 1100D 550D 500D 100D 6D, 1Ds Mark III, 1Ds Mark II, 5D Mark III, 5D Mark II, 1D Mark IV, 1D Mark III and Nikon D7200 D7100 D7000 D5200 D5100 D5000 D3000 D3100 D300 D300S D700 D600. Box includes dedicated digital SLR AF Flash, flash stand, flash diffuser and pouch. MAKES A GREAT GIFT - - The Altura Photo Professional Speedlite Flash (AP-UNV1) is a powerful manual flash with a High Guide No. 38(m). Suitable for photographers of all levels. Altura Photo Universal Digital Flash (1 Unit). Electronic flash new in box. For use with Canon, Nikon, Sony and other hot shoes. SUPER SAVINGS Brand New, excellent, unused, no cosmetic issues, not refurbished All units in this listing are new and unused with no blemishes and exactly the same as units listed at a higher price from this seller, except the blister package shell holding the flash will have a cosmetic damage, (folded corner, cracked or missing plastic edge or may not be pretty enough for gift giving.) Includes mini manual and display card as pictured. So... if you want to save a couple of dollars and don't care about the packaging, this listing is for you ! Same care to shipping is included, will be bubble packed. Really nice, fast response. Sunpak DF3600U TTL Manual DSLR Flash for Canon and Nikon Cameras, slave mode too. Being sold elsewhere for up to $99.00 The Sunpak DF3600U flash is the perfect accessory for today’s digital SLR cameras. 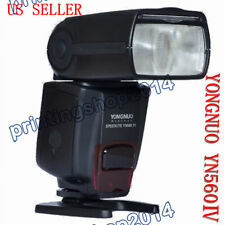 ESDDI Flash Speedlite for Canon Nikon Panasonic Olympus Pentax and Other DSLR.... Condition is New. Shipped with USPS Priority Mail. 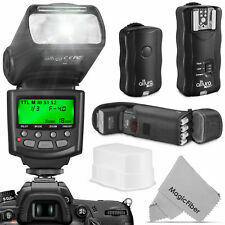 PIXEL M8 flash Wireless speedlite LCD For Sony Nikon Canon EOS D50 7D SLR Camera. Shipped with USPS Priority Mail. TTL compatible with all Canon EOS bodies / E-TTL features with select Canon EOS bodies. Works with all Canon EOS bodies / Swivel head for bounce flash photography. Hunt's has been trusted choice for 112 years and we have outlasted many competitors, especially in this Internet age. Bower Dedicated Autofocus Flash-Canon E-TTL I/II For Canon DSLR Camera. Condition is New. Shipped with USPS Priority Mail. Supporting multiple modes, such as TTL automatic flash mode, S1 / S2 wireless flash mode, stroboscopic flash mode and more. TTL: ITTL/ETTL. Lightweight and portable, useful tool for photographer lovers. Flash coverage: 18-180mm Manual zoom, Swinging/Tilting flash head (bounce flash). Flash mode: M/MULTI/S1/S2. The wireless trigger: S1/S2 induction flash. 1 x NW625 Flash. Color Temperature: 5600K. 1 x Hard Diffuser. 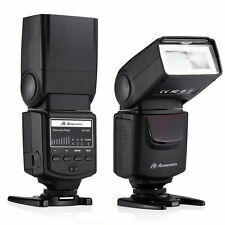 The Altura Photo Professional Speedlite Flash (AP-UNV1) is a powerful manual flash with a High Guide No. 38(m). Suitable for photographers of all levels. Altura Photo Professional Universal Digital Flash (2 Unit). (3) Flash mode: TTL, M, RPT. 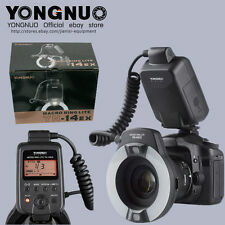 5) Compatible with E-TTL flash automatically. Flash mode: E-TTL, M, RPT. 14) Mini USB Interface. External interface: hotshoe, Mini USB. 8) LCD display. 1 User Manual(Chinese & English). (1)NW620 Manual Flash. 1 x NW620 Manual Flash. Flash coverage: 18-180mm Manual zoom, Swinging/Tilting flash head(bounce flash). 2.9s; Flash Mode: M/MULTI/S1/S2. Universal foldable flash diffuser provides soft even flash illumination;. • More approach natural light use high quality led light. There are seven levels luminance. • Nikon: D7000, D5000, D5100, D3100, D3000, D3 series, D700, D2 series, D300 series, D200, D90, D80s D70 series, D60, D50, D40 series, F6. Canon lens About the Sunpak flash. Full Digital TTL dedication. > The flash have been tested and function well (see pictures). > I received it as a X'mas gift but not need it anymore. TTL Speedlite Flash. Flash L Bracket. This Paging Zone Flash Bundle Includes Soft Flash Pouch. Colored Flash Diffusers Kit. Mini Stand. The Altura Photo Professional Speedlite Flash (AP-UNV1) is a powerful manual flash with a High Guide No. 38(m). Suitable for photographers of all levels. Altura Photo Professional Universal Digital Flash (3 Unit). 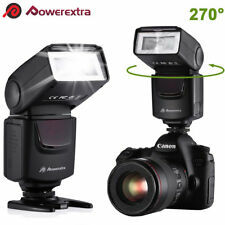 Powerextra Canon E-TTL/ E-TTL II, Nikon i-TTL/ TTL Flash Speedlite. WIDE COMPATIBLE DSLR: Suitable for CANON Rebel (T6i T6 T6s T5i T5 T4i T3i T2i T1i XT XTi XSi), CANON EOS (750D 760D 650D 600D 550D 500D 450D 400D 350D 300D 7D 60D), NIKON (D7200 D7100 D7000 D5500 D5300 D5200 D5100 D5000 D3300 D3200 D3100 D3000 D700 D600 D500 D90 D80 D70 D60 D50) etc. 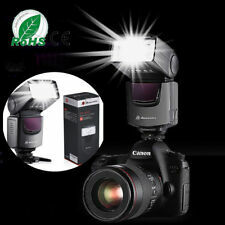 PROFESSIONAL FLASH FOR CANON EOS REBEL DSLR. • Swivel 60° / 75° / 90° / 120° / 150° / 180° left and 60° / 75° / 90° right. 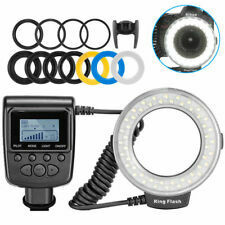 This flash can be used as a universal flash or slave unit, giving you more options during photography. 2.4G Wireless Trigger 1 X 2.4G Wireless Trigger. Wireless Transmission Distance: 50 M. Wireless Frequency: 2.4G. Flash Type: M Multi S1 S2. Flash Duration: 1/300-1/20000S. Flash Coverage: 24 mm. Net Weight: 38g. NW670 Speedlite Flash Softbox with S-type Bracket Compact and portable softbox can disperse and soften light for more even balance and distribution. SOFTBOX WITH S-TYPE BRACKET MOUNT: Bowens mount design, the speedlite can be clamped firmly into the mount both horizontally and vertically; Compact and portable softbox can disperse and soften light for more even balance and distribution. 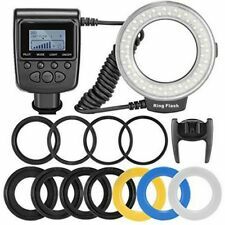 RF550 Series Macro Led Ring Flash. Canon, Nikon, Panasonic, Olimpus DSLR. And 3 different flash difuser. Crazy Prices USA Team! We want to get your order to you as quickly as we can. 2.4G Wireless Trigger 1 X 2.4G Wireless Trigger. Wireless Transmission Distance: 50 M. Wireless Frequency: 2.4G. Flash Type: M Multi S1 S2. Flash Duration: 1/300-1/20000S. Flash Coverage: 24 mm. Power Bank 8.